Every now and then the Olympic movement produces one of the really good guys. (And women, too. Stand down, politically correct police.) The Budapest 2024 bid came Wednesday to a crashing end. It became the latest, if predictable, victim of a taxpayer revolt in Europe tied to obscenely bloated and, no coincidence, government-funded Olympic-related infrastructure costs. Balázs Fürjes led the Budapest 2024 effort. He is one of the world’s really good people. Smart, clever, imaginative, dedicated, devoted, resourceful, patriotic, the vision thing. It may seem perhaps a small note amid a very big problem confronting the International Olympic Committee that Balázs Fürjes will likely be sidelined, at least for a while, from the Olympic scene. But it is altogether exceptionally telling. Ladies and gentlemen, this column marks another in a recent series dedicated to developments in the campaign for the 2024 Games. It is straight talk; there is zero point in anything else at such a critical juncture. Apologies in advance for the length. It’s not just that the Olympic movement is reeling from the fallout of yet another city from its last two bid races, for the 2022 Winter Games and 2024 Summer Games. Voters in Europe are, in a phrase, pissed off, and the IOC is at an inflection point, the question being whether the members will do the only sensible thing at their assembly this September — that is, pick a privately funded entity, Los Angeles, for the 2024 Summer Games. The only other candidate left is Paris, another government-funded outfit. Along with the assembly-line disappearance of so many cities goes a corollary, if little noticed, piece: the human capital that animates the bids, the campaigns, the would-be organizing committees. This is, in a word, a disaster. The Olympic movement depends on a lot of things. It needs money, of course. A significant chunk of which, it should be noted, is American. It needs technology and other resource. Mostly, though, it needs people, and what people of goodwill from all corners of our imperfect world can bring to the table: creativity, innovation and inspiration. That is why the IOC needs LA for 2024. Yes, I live in Los Angeles, and have since the end of 1992. I married an LA girl. Our kids were born and grew up in Southern California. I am not an agent for the Los Angeles bid. I am not a consultant for the Los Angeles bid. I am not being paid by them. I am not, in any way, working for or on behalf of the bid. If you know anything about the politics and geography of Los Angeles, this would be manifestly plain. The LA 2024 people are, generally speaking, UCLA people. I teach at the USC journalism school. I live in Palos Verdes, about a half-hour south of USC on the 110 Harbor Freeway. Palos Verdes is USC country. Very close family friends are such USC freaks that they get up every USC football Saturday to claim a Coliseum tailgate space at 3 in the morning. Wednesday is trash day in our neighborhood; when I went out at 6:55 this morning to take our trash cans to the street, I said hi to my neighbor, Richard, who as ever was walking his two dogs; Richard was wearing his cardinal-and-gold USC sweatshirt. The LA24 bid has been up and going for roughly 18 months. In that time, I have not had one coffee, one lunch, one dinner with the bid team. We have kept a respectful professional distance. Ed Hula of Around the Rings and I are perhaps the only American reporters to have covered in depth every single IOC bid contest since 1999. I am highly confident I know what I’m talking about when it comes to these campaigns. This is why — and even if you are a critic of my work, totally fine, you nonetheless ought to acknowledge I have at the least been thoroughly consistent — I was the first journalist anywhere to say that Boston was doomed, that the U.S. Olympic Committee had made a huge mistake and that the USOC needed to re-group and come to LA. That was way back in March 2015. My French friends in particular may not like how explicitly straightforward this column has been in expressing why, for two years now, LA was the plain answer to the Olympic movement's obvious problem. C’est la vie. Reminder to all: this is not personal. This is journalism. The IOC has got itself — and this is its own damn fault — in a crack. For roughly the past 20 years, the IOC has turned to government-underwritten Games that, time and again, have proven hugely, inappropriately expensive. This model can be traced to Barcelona in 1992. Those Games jolted mayors, governors, prime ministers and presidents into this realization: the Olympics could serve as a seven-year public policy (that is, public works) catalyst to get built what would otherwise take 20, 30, 40 or more years to get done, if ever. Short list from many examples: Athens (2004) metro and airport, Beijing (2008) building spree, Sochi (2014) literally two new cities (Adler, Krasnaya Polyana) from scratch. Two, over those seven years, economic conditions can — and do — change. (See Rio, 2009-16). Three, as a consequence, government commitments can — and do — change. The bill for all those infrastructure projects, which were the in-fact underpinning of everything that led to that cauldron lighting, inevitably become grotesquely fat like yo mama. $12-15 billion Athens 2004, $40 billion Beijing 2008, $15 billion-ish London 2012, presumed $20-billion Rio 2016, worries over $25-30 billion for Tokyo 2020 when the bid said it would be done for $7.8 billion, and the No. 1 monster, $51 billion, Sochi 2014. When a bid and follow-on organizing committee are government-financed, who gets stuck with these bills? Now, taxpayers in western democracies are saying, no more. The IOC — right or wrong — is the very definition of that. In a move that underscores the IOC’s ongoing disconnect, president Thomas Bach announced a huge sponsor deal with Chinese e-commerce giant Alibaba at last month’s World Economic Forum in Davos. Of all places. Davos, symbol of the global elite. This is why taxpayers, particularly in Europe, are telling the IOC to go, you know, itself. This past Sunday, voters in Davos/St. Moritz, in a referendum, said no to the notion of a 2026 Winter Games. Four years before, they had said no to the idea of a 2022 Winter Games. Indeed, for 2022, six cities in Europe dropped out, five put off to varying degrees by the $51 billion 2014 figure: Oslo, Munich, Stockholm, Davos/St. Moritz and Krakow, Poland. A sixth, Lviv, Ukraine, fell out because of war. Five cities started for 2024 in September 2015: LA, Paris, Budapest, Rome and Hamburg, Germany. Hamburg went out in a referendum. With it went the likes of the bid's creative chief executive, Nikolas Hill, and a hugely talented spokeswoman, Susanne Jahrreiss. Rome pulled out because the mayor said the city had other priorities. Just like, four years beforehand, the prime minister had said the country had better things to spend money on. This makes for the natural bridge to why LA for 2024. There is now considerable worldwide talk — look it up, last September I was the first in the press to write at length about this notion — of awarding two Games at one time. My point was LA 24 and Paris 28, not the other way around. If there is to be a two-fer, it has to be that way: LA 24, Paris 28. This space has made this point before so here it is again: the IOC formally accepts bids via national Olympic committees, and 2024 is the end-game for the USOC. The IOC can not ding the United States of America’s Olympic committee three times — New York for 2012, Chicago for 2016, LA for 2024 — and expect the Americans to keep coming back. That story will be done. Finished. Over. For a long time. If you want to believe otherwise, fine, maybe you want to believe in unicorns or fairies, too. Line up here: I have a bridge in Brooklyn for you. Everybody needs to wrap their heads around what is, truly, reality, and the sooner the better, because in the United States it takes private money to run bids and private money to run Games and after $240 million in private money over three bids and some 14 years devoted to the three largest cities in this country, the USOC and all those generous donors would be spent, financially and, probably more important, emotionally. Done. Finished. Over. It seems increasingly unlikely there would be a 2024-2028 two-fer. Why? There’s all kinds of resistance. From other would-be bidders in Europe: if the French go down for 2024, a bunch of cities would love to bid for 2028. These would likely include Madrid, Budapest, Milan, even St. Petersburg (laugh if you wish but Mr. Putin, still, tends to have significant influence in the Olympic orbit) and, let’s face it, Paris. You can throw all the Brisbane talk you want onto the barbie but no way the IOC is going to Australia in October — not with the way television ratings tanked in September in Sydney in 2000. From the IOC members: there was no two-fer in the 2022 Winter Games race, when the race got down to two, just Beijing and Almaty, Kazakhstan, so why a Summer 2024 two-fer? Many of the IOC members already complain they do less than Tarzan’s tailor. Voting on the site of the Games is their one big responsibility. Taking that away would be yanking away the essential perk of membership. From LA24: if you are the LA people, why hedge? In a two-dog race, if you are LA, you would have to quietly and humbly like (to take) your chances against Paris. What is the IOC’s No. 1 problem? Again, keeping it simple: as this taxpayer revolt has proven, the IOC has a massive credibility problem. At the core of that credibility problem is a branding problem. Let’s put sentimentality away. You like French wine? Awesome. There’s great wine in California, too. At issue is what is best for the Olympic movement, not just for 2024 but for years into the future. Paris is talking only 2024. LA is talking 2024 and — beyond, well beyond. That is what is at stake. Does the IOC want a 2024 Old World Games … in an older city … that will be paid for by government … a government almost surely subject to change/s over seven years … when Frexit is suddenly a major issue … when the government will have to build an athletes’ village … that if history is a reliable guide will cost way more than budgeted … in a precinct that is currently being rocked by violence … not far from where the central stadium was hit by a terror attack … in a city where over seven years the city will no doubt endure public strikes … and the weather every summer, which is why the locals flee, is hot and muggy? Does the IOC want a privately run Games that, because it’s privately run, has no margin for error and has to come in at or under budget, just like 1984 … with an already-built village at UCLA where thousands of college kids happily come and go every day … in perfect California summer sunshine … in a city where the Olympics have an approval rating nearing 90 percent … in a region and state that’s full of youth, tech and social media and that will, like 1984, kickstart it all over again for the movement for an entire generation? To reiterate: in Europe, the IOC is getting thrashed but in LA, based on sunny memories from 1984 and 1932, the locals when most recently polled said yes to the Olympic Games to the tune of 88 percent. When logic is applied, what about this is even remotely a remotely difficult choice? Earlier this month, the Paris bid unveiled its slogan on the Eiffel Tower to what officials thought was great fanfare: “Made for Sharing.” In English. With great respect to the French academy, because its job is to protect the French language, next came the howls of protest. The next thing you knew, the slogan was suddenly “Venez Partager” along with the English version. What 16-year-old skateboarder or surfer would possibly care? In announcing that "sharing" slogan in English, our Paris friends had a good laugh at American expense, they thought, because it was a not-so-subtle play on bridges and walls and the American president. Then it turns out the French authorities are, for security purposes, going to build a wall around the Eiffel Tower. Back to Rio, and the government chaos that bedeviled nearly everything there. Whether Marine le Pen wins the French elections this spring or not, who wants to believe that for the next seven years the French government is going to rest in a state of calm serenity? Rail on Donald Trump, or whatever. A privately funded Los Angeles enterprise means that whatever is going on in Washington is, for the most part, going in Washington. LA is LA is LA. This is the key distinction that underpins a privately organized American bid, and right now this is the secret to what the IOC needs — it needs time, it needs stability and it needs all the other stuff LA and California can bring to the table, in particular creative energy. The range of Hollywood studios. Disney. Snapchat. Facebook. Apple. Twitter. Netflix. Electronic Arts. Oracle. Feeling a little more creative? Annex Oregon and Washington just up the Pacific coast: Nike and Microsoft, for starters. Throw in Starbucks. Or, back to LA, The Coffee Bean & Tea Leaf (big in Asia, too). Seriously, why the Olympic movement doesn’t have an association with Starbucks or Coffee Bean — where do young people hang out and soak up the free WiFi, for god’s sake — is beyond common sense. Balázs Fürjes was careful on the telephone not to endorse either of the remaining two bids. Even so, the IOC president, executive board and members — for that matter, anyone with an interest in the Olympic movement’s future — ought to pay careful attention to his words. Hamburg’s 2024 Olympic bid went down Sunday to devastating defeat in a referendum, a result that is — no reason to mince words — bad, just very, very bad, for the International Olympic Committee and, especially, IOC president Thomas Bach. Even with all kinds of external factors weighing on the vote — the Paris attacks, a scandal involving Germany’s winning 2006 World Cup soccer bid, the refugee crisis in Germany and across Europe, and more — the vote marks a sharp repudiation of the IOC’s Agenda 2020 would-be reform plan and, indeed, Bach’s leadership, both substance and style. Worse, it’s a repudiation by his own people. Bach is, for anyone even remotely familiar with the Olympic scene, himself German. Indeed, before becoming IOC president, he was head of the German Olympic confederation, which goes by the acronym DOSB. The no vote Sunday amounted to 51.6 percent; yes, 48.4 percent. About 650,000, or half, of the eligible 1.3 million voters in Hamburg took part. It leaves four cities left in the 2024 race: Paris, Rome, Budapest and Los Angeles. The IOC will pick the 2024 winner in 2017. The balloting Sunday is intriguing for any number of reasons. It shows what bad business it is — if in many ways understandable — how a few percentage points either way can make or break a massive project, and not just an Olympics. A better result would have been a big number, either way. It clearly suggests, too, that it’s the end — and probably for a very long time — for bids from Germany, traditionally one of the most important nations in the Olympic scene. “It looks like thoughts of Olympia and Germany don’t go together,” Alfons Hörmann, now the president of the DOSB, told reporters. It’s actually way beyond that, and this offers the most intrigue. Fundamentally, the IOC is looking at a profound brand crisis. It’s now Bach’s job to get out front and fix it. Bach, in his two-plus years as IOC president, has acted as a global diplomat of sorts, meeting — by his own count — some 100 heads of state or government. He has traveled repeatedly to the United Nations. Everywhere he goes, the IOC president takes pictures. There’s invariably a press release. Mindful that all politics, even global politics, is local, here is the core question: how much time, effort and energy did the IOC president spend over the past six months in Hamburg, talking up the bid with voters and key officials? What is the point of meeting heads of state x, y and z if you can’t even get your own home country to understand the financial picture and then get excited about the Olympic enterprise? To draw an American analogy, Bach has been like the congressman who is always in DC but never at home, listening to and engaging with his constituents. In Bach’s case, that means he has been either at IOC headquarters in Lausanne, Switzerland, or at some presidential palace, somewhere. The IOC, in fact, has a great story to tell. Why isn’t it — and in particular, the IOC president — out there doing exactly that? When people don’t want you, something’s wrong. Very wrong. And in recent months around Europe, the IOC’s traditional base, voters and public officials have made it increasingly clear they either don’t want, or plain-out fear, the Olympic brand. The Olympic story is supposed to be that the Games come to town and that’s a good thing — promoting not just the sometimes-ethereal notion of a better world through sport but the concrete concept of a positive after-Games legacy. Oslo; Stockholm; Davos/St. Moritz, Switzerland; Krakow, Poland; and Munich. The sixth 2022 European entrant — Lviv, Ukraine — fell out because of war. Munich bid for the 2018 Winter Games, and lost, to Pyeongchang, South Korea. A Munich 2022 bid probably would have won going away. Instead, the would-be Munich effort was killed — just as Hamburg’s was Sunday — by voter referendum. So, too, Davos/St. Moritz. Krakow, as well. Oslo put on the 1952 Winter Games, Lillehammer the 1994 Winter Games; Stockholm, the 1912 Summer Games; St. Moritz, the 1928 and 1948 Winter Games; Munich, the 1972 Summer Games. So it’s not as if there isn’t historical precedent to make the case to the locals all about the upside of an Olympics. Moreover, within a few days of the St. Moritz/Davos balloting, voters in Austria rejected a 2028 Summer plan. Innsbruck put on the 2012 Winter Youth Games; it staged the 1976 and 1964 Winter Games. And Salzburg bid for the 2014 and 2010 Winter Games. In early 2012, the then-prime minister of Italy called off Rome’s 2020 bid, citing uncertain costs associated with the project. Rome put on the 1960 Summer Games. What else did the IOC need to hear, and start grappling with, the problem? By the end, the 2022 race proved completely illustrative of the dynamic, featuring just two survivors, Beijing and Almaty, Kazakhstan. In IOC voting this past July 31, Beijing won for 2022, even though there is little to no snow in the mountains roughly two hours away where the ski events would be held, and the bid budget did not include, for instance, the billions it’s going to take to build a high-speed rail line from Beijing up to the ski venues. In December, 2014, the IOC members had approved, unanimously and with almost no public dissent, Agenda 2020, Bach’s 40-point reform plan. How was a vote for Beijing, with environmental and human rights issues, and budget fudging from the outset, in line with Agenda 2020? Two days after the 2022 vote, meanwhile, at that very same IOC general assembly in Kuala Lumpur, at Bach’s invitation, the members heard at length from Sir Martin Sorrell, chief executive officer of London-based WPP, the global advertising and marketing group, about — its brand. In large measure, the speech focused on digital opportunities, including the one undeniably new initiative in Agenda 2020, the creation of an Olympic TV channel. That said, Sorrell’s broad observation is worth revisiting anew. Now is precisely such a moment. Communication about what the IOC is, and the Olympic Games can be, needs to be radically revised. 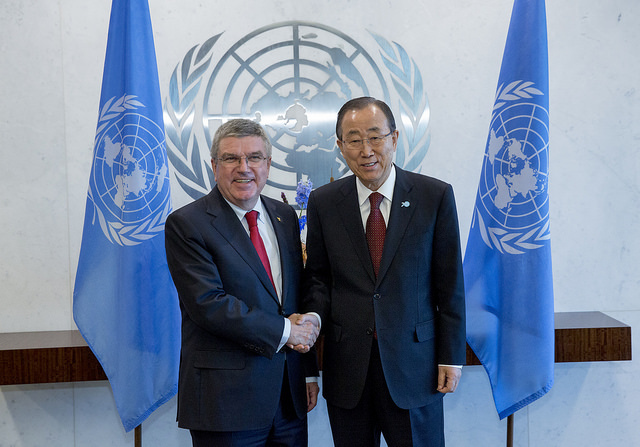 And Bach ought to consider far-reaching changes in the the way the IOC president approaches the bid process. As the IOC’s then-executive Games director, Gilbert Felli, said some 16 months ago in observation about the 2022 fiasco, “So in the communications, and that’s the lesson from this campaign here, we lost good cities because of the bad perception of the IOC. There remain those four cities for 2024. Again, Paris, Rome, Budapest and LA. Four, yes -- but for how long? What is the chance the Italians pull out again? Rome has municipal corruption and fiscal woes, big-time. How serious, really, is the Budapest effort? Bach would probably — strike that, almost definitely — say that as IOC president, his job is to remain studiously neutral in any IOC election. But he can take a neutral position with regard to the cities themselves even while doing what he should — strike that, must — now be doing: rallying support for the Olympic movement itself, and the notion of a local Games. The president is too smart and sophisticated not to understand this basic: his job is not to stand by and watch the fraying, if not destruction, of the Olympic brand. All because he wants to remain neutral? In this context, he is the farthest thing from neutral. He has to be an advocate. Bach needs to go in the next several weeks and months, and repeatedly if need be, to the four markets remaining in the 2024 race — note, four major global markets — and, as Sorrell advised, make the case for why the Games are relevant, fun, interesting and deserve to come to town. Enough with the heads of state and the photo ops, at least for now. Be accessible. Be real. Be relevant. Leadership means accepting responsibility, confronting challenge and delivering solutions. If there was any doubt before, Sunday’s vote in Hamburg can leave none. It’s time to see some real leadership at and from the IOC. And that starts at the top.